A recent news report said five undersecretaries and 620 government employees who were holders of fake degrees were nabbed in a campaign against forged certificates. The story is not only worrying but nauseating as well. I have no doubt that many readers felt depressed after reading the report. 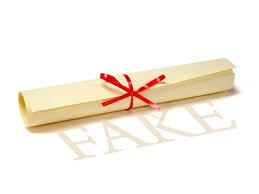 We had earlier unbarred a long list of Saudis carrying fake degrees. Now the scandal has reached very senior employees in the government whose task is to formulate strategies and take crucial decisions. The logic says that these people should be ashamed of themselves and should hide in the shadows so as not to be discovered. The entire issue defies logic. The holders of the faked degrees are not ashamed of what they have done. On the contrary, these people walk with confidence and pride, and they compete with holders of authentic degrees for high positions. The news item talked about a campaign to crack down on the holders of forged degrees. The word “campaign” brings to our minds the street patrols to crack down on foreigners who violate work and residency regulations, the municipal raids against expired goods in shop shelves and the clampdowns on bootleggers. The word “nabbed” also brings to our minds the arrests of the dangerous gang leaders. In fact, the holders of the forged certificates who fill top government positions are more dangerous than the crime gang leaders because they have extensive powers by which they can use to destroy society. If the campaign, which lasted only one week, had discovered more than 620 forged certificates approved by 22 government departments, we could imagine what would have been discovered if it continued for several weeks. The uncovered bogus PhD degrees were 234 while the master’s degrees were 330. The bachelor’s degrees are at the bottom of the ladder with 56 forged certificates. This shows that the fraudsters were going after higher degrees since that would guarantee them better positions. The news report said a leading government official, who was caught for forging his PhD degree, has resigned. It also said more than 2,000 government employees are expected to ask for early retirement during the next eight months. So far we have no information about the five undersecretaries, the directors general and the leading employees who were found to be carrying forged degrees. The report did not say if they would be given immunity that would enable them to remain in their jobs or that they would be put on early retirement as the maximum punishment against them. These two options are both unfair to the country.